"This may be the first epidemic in history of which no one officially died." Although virtually unknown to the general public until the late 1980s, the struggle against AIDS began years earlier. Unfortunately, politicians, members of the mainstream press, and even highly regarded science organizations virtually ignored this deadly virus. Many considered it a problem that solely resided within the homosexual community and failed to realize its potential. In his novel And the Band Played On, San Francisco Chronicle reporter Randy Shilts painted a shocking and comprehensive portrait of the AIDS virus. It enlightened many eyes to the shortsighted, selfish attitudes that blocked the fight against this disease. No one was free from blame, including President Ronald Reagan, who failed to address the issue while people died all across the world. Originally airing on HBO, this film provides an honest, disturbing portrait of the battle to get the word out about the dangers of AIDS. 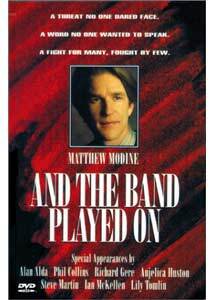 Its centerpiece is Dr. Don Francis (Matthew Modine)�a fiery and intelligent young man who refuses to play the bureaucratic game. Along with colleagues at the CDC like Dr. Harold Jaffe (Charles Martin Smith), Dr. Mary Guinan (Glenne Headly), and Dr. Curran (Saul Rubinek), he atempts to uncover this mysterious new entity that kills at an alarming rate. Their investigation reveals the intense dedication in each individual to save future lives. At all hours of the day and with a severely limited budget, they conduct an array of case studies and interviews to discover the roots of the virus. While the scientists search for answers, numerous people continue to contract this disease and die with startling precision. This story succeeds through an impressive combination of technical elements and touching, emotional moments. Bill Kraus (Ian McKellan) fights constantly for the equal rights of homosexual men in San Francisco while his heart yearns for a meaningful relationship. When he contracts the AIDS virus, it's extremely significant because it has hit a responsible and respected adult. McKellan brings a tremendous amount of compassion to his character within a limited amount of screen time. His story brings a much-needed human element to this compelling movie. Richard Gere also delivers a surprisingly compassionate performance as a famous choreographer stricken with the disease. Although he appears in only a few scenes, his character is not easily forgotten. The key moments in And the Band Played On occur within the meeting rooms of the CDC, where the scientists search for an understandable explanation. Their problems lie with finding concrete evidence to support their hypotheses. Groups like the FDA and Red Cross hide behind the burden of definite proof to avoid spending major dollars on a supposedly "gay" disease. This places tremendous pressure on the scientists, who must return to the drawing board and start over again and again. When significant discoveries are made, they still must prove them to an uncaring world. Another problem lies with Dr. Robert Gallo (Alan Alda), an egotistical man who tries to wrest credit for the discovery of the AIDS virus from the French. His selfishness threatens to bog down the efforts of doctors around the world. It's amazing that writer Arnold Schulman is able to bring the numerous story lines together into a coherent whole. Although he condenses much of the book, the major players and events remain in full force. Randy Shilts became yet another victim of AIDS when he died on February 17, 1994. His death only solidifies the message of his novel and its corresponding film, which challenge everyone to rethink their ideas about the virus. What would have happened if Ronald Reagan had placed his support behind AIDS research back in 1981? While it's impossible to fathom the sad effects of political obstacles to the struggle, it is a definite issue that still warrants dialogue today. Although it presents numerous frustrating images, this film ends on a somber and slightly positive note. Shots of large crowds holding up candles and individual acts of charity signify that perhaps there is a ray of hope in the future. Improvements are being made, but there's still a long road ahead before we can conquer this disease. Image Transfer Review: And the Band Played On takes place mostly within interior settings of doctors' offices, meeting rooms, and labs, so opportunities for innovative visuals remain fairly limited. This 1.66:1 anamorphic widescreen transfer presents the images decently without containing anything exceptional. A few minor specks of dirt do appear intermittently, but they aren't too distracting to cause any serious hindrance. The black levels are fairly solid, and the bleak colors look fine. The events on-screen come across clearly and in good form, and the amount of grain is minimal. Audio Transfer Review: With the exception of the mournful score, there are few significant sound elements in this film. Nearly all of the story consists of dialogue spoken in meetings between scientists, the press, and AIDS patients. The 5.1-channel Dolby Digital transfer features an impressive level of clarity and depth. Although it's hardly tested, all of the pivotal moments are easy to decipher. This disc also contains a 2.0-channel Dolby Surround track that varies only slightly from its companion. Both transfers are worthwhile and work effectively to present the film and its message. Extras Review: The lone extra feature on this disc is a nice collection of cast and crew biographies. Each entry contains several pages covering the careers of the major actors, writer Arnold Schulman, and director Roger Spottiswoode. Although there are no filmographies, the 11 sections do provide a decent overview of each individual and their past works. Also noteworthy are the impressive menus, which improve over HBO's usually drab, static presentations. And the Band Played On works successfully in creating an overview of the early years of the AIDS crisis. On a more personal level, it also presents intimate stories that put a compassionate human face on these events. This combination keeps this story intriguing throughout its lengthy running time. Along with its literary predecssor, this film is a must-see for anyone in need of education about the history of this deadly virus.